Empire City 1931 is an arcade game that was developed by Seibu Kaihatsu and largely distributed by Taito Corporation in 1986. A very early example of a first-person shooter, it placed the player in the center of a city filled with would-be assailants who try to shoot the player before he or she can shoot them. It is supposed to take place in 1931 in New York City during the height of Prohibition, pitting you as a vigilante determined to stop the Mafia. In Germany, the game was published under the title Street Fight. 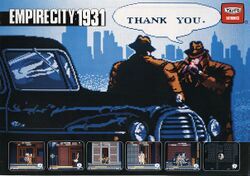 Empire City 1931 was not incredibly popular, but it was released on several platforms under many various names. The most common alternate title is Prohibition, which was the title given to the European releases on the Amstrad CPC, Commodore 64, MS-DOS, Atari ST and ZX Spectrum home computers, ported and published by Infogrames. The game was also ported to two systems in Japan, including the MSX line of home computers under a different title Magnum Kiki Ippatsu (マグナム危機一髪, Magnum Kiki Ippatsu? lit. Magnum near miss), and for the Famicom under the combined title of Magnum Kiki Ippatsu: Empire City 1931. These two Japanese versions were ported and published by Toshiba EMI. Although the game was developed for the Famicom, it was never converted for release outside of Japan on the NES. The year: 1931, the golden age of Mafia Power. The place: Manhattan, New York. This story is the account of a youth whose family was innocently trapped and killed in a bloody gang shoot-out, and who single handedly fought against the Mafia to avenge their death. The player is situated across the street with a sniper rifle, looking for targets to shoot. You can look in eight different directions, and your view of the block will scroll around. The enemies hide and shoot at the player from various places; squatting on a roof, peering out of a window, and even standing in plain sight on the sidewalk. Move the on-screen gun-sight with the joystick to search the area for gangsters. An arrow will appear on the screen to let you know whether a target is to the left or right (but not above or below.) When you see one, shoot him down by pressing the fire button before the target shoots you. Your gun-sight will turn yellow when your aim is accurate enough to kill him with one shot. Before a gangster shoots you, a timer will count down on the lower right corner of the screen. You must locate and shoot the gangster, or avoid getting shot by pressing the dodge button, before the timer reaches 0. In order to dodge an attack, you must time the action just before the shot is fired. It will cause your gun-sight to move significantly away from where you were aiming. There are 8 different levels in the game. You must defeat all of the enemies in each round to advance to the next. In the last level, you must shoot down the Mafia boss with one shot. If you fail to hit him, the boss will shoot you. You begin each round with 170 bullets, and you can increase this supply by hitting a small ammunition box hidden within various scenes of the game. In addition to increased ammunition, there is a bar of gold inside the box which you collect for bonus points. You will lose a life if you get shot, or if you use up all of your ammunition. The game ends when 3 players have been lost, however you can continue play in most versions of the game. This page was last edited on 2 November 2011, at 21:46.